Summer is here and I'm sure every parent is looking for something fun, new and exciting for their children to enjoy. While I am one of those parents who wants my children to enjoy the weather outdoors as much as possible there are still days where we need to slow down and enjoy an indoor activity. One of our favorite indoor activities to just sit back and relax is to watch movies together. Our most recent rainy day movie was Wisharoo Park! We snuggled up on the couch with a big bowl of popcorn and enjoyed the show. 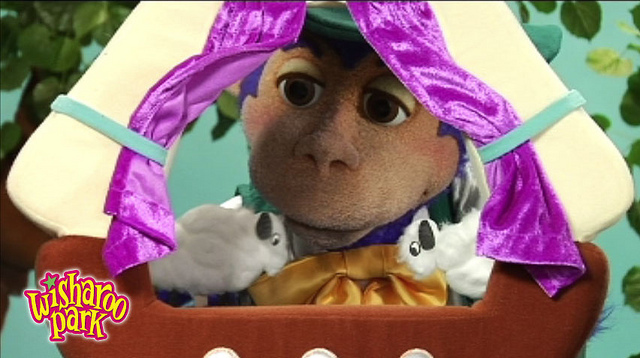 The mix of people and puppets makes Wisharoo Park both fun and educational. The puppets are simply adorable and are sure to capture the attention of even the busiest child. Children will learn a number of very valuable and important life lessons by having fun! As a parent, I know that when you make learning fun it's beneficial to everyone involved - especially the children! 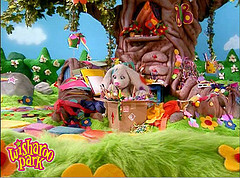 Wisharoo Park does exactly that with the use of cute and colorful puppets, singing, action, imagination and animation. My 7 year old daughter thought it was cute and funny. My 10 year old son said it was for babies but that didn't stop him from watching it with us. We all know how 10 year old boys can act! We had the chance to enjoy this and now we are going to pass it along to my 1 1/2 year old nephew. It's something that he can enjoy now and grow with. The Wisharoo Park website is a super kid-friendly place for learning and fun too! Fun games, name your own wish stars, storytime and fun activities. The perfect place for both children and parents. New and exciting content is added weekly so there is always something fun and different! An adorably engaging, exciting, entertaining and educational Wisharoo Park is dedicated to promoting positive self-image and self-esteem in preschool age children that is sure to capture the hearts, minds and imaginations of young kids aged three to six years old. It was originally introduced on air as a children’s television series on PBS stations across the country with a loving embarrass by its audience and met with great critical praise and accolades for its positive messaging, production quality and superb music and story lines. It is now rolling out as a dynamic multimedia program which includes the interactive website, WisharooPark.com, DVDs, apps for mobile media devices, and much, much, much more! Visit Wisharoo Park and tell me something you learned or something you like. A special thanks to Wisharoo Park for this great review and giveaway opportunity! this site looks like alot of fun im going to have to bring my little ones here in the morning. 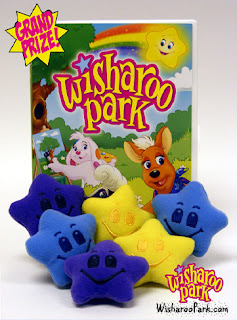 I learned that Wisharoo Park is specifically focused on teaching social skills and building self-esteem. I like that it teaches social skills. Super cute, I have never heard of Wisharoo before but I will definitely check it out now. I like that it is for promoting good self-esteem. That is one thing that will help our children grow into healthy happy adults! I like the story time videos on Wisharoo Park website. I love that they focus on two very important aspects of a child's emotional development - social skills and self-esteem. So many of these types of companies try to do everything at once - learning, social skills, physical activity, etc. that they don't do any single one well. The fact that there are only two main focuses here makes me feel as if it will be done very well. I learned that It is the mission of Wisharoo Park™ to consistently offer our most precious resource, our children, a creative means of social development and self-discovery. I like WP on Facebook. I follow WP on Twitter.